At Canyon Heights Academy, we take Preschool seriously. 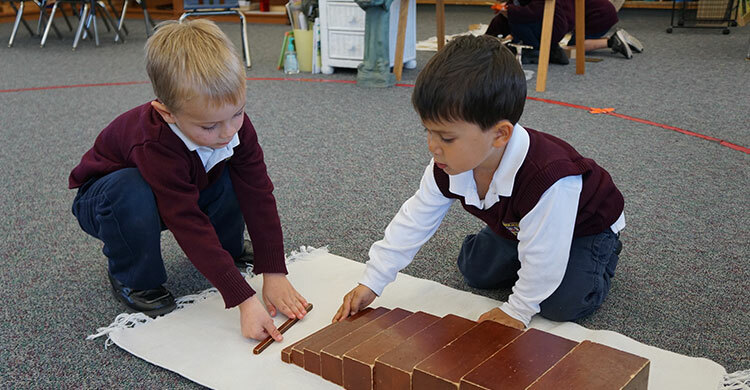 Incorporating the Montessori method with our Catholic/Christian base, we are able to prepare a young child to be confident and ready for Kindergarten and beyond. Three separate programs are offered to meet the needs of any family: Mommy & Me for children up to 3 years of age, Early Montessori for children from 18 – 36 months and our Montessori Preschool for children from 3-5 years of age all focus on developing important skills needed to be successful in school and life. Your child will develop an early enthusiasm to explore and learn important reading skills, the world of numbers, and an appreciation of science. He/She will also explore various art media and be introduced to beautiful music by various composers. Each program addresses a child’s needs in a developmentally appropriate manner.